An X1.1-class solar flare (lower right) erupts from the sun on July 6, 2012, in this image from NASA's Solar Dynamics Observatory. 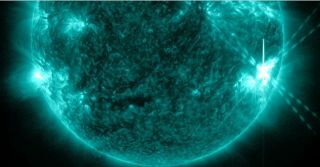 The most powerful solar flare of the summer so far erupted from the sun Friday (July 6), the latest in a string of powerful storms this week from our nearest star, space weather experts say. The sun storm occurred just after 7 p.m. EDT (2300 GMT) and registered as a class X1.1 solar flare — one of the strongest types of solar flares possible, according to the U.S. Space Weather Prediction Center (SWPC) run by NOAA and the National Weather Service. The huge solar flare erupted from the giant sunspot AR1515, which has already fired off several other powerful storms this week. Space weather scientists were closely watching the sunspot for possible X-class flares. "And AR1515 did it! X1-class solar flare," officials with NASA's sun-watching Solar Dynamics Observatory wrote in a post to @Camilla_SDO, the mission's mascot Twitter account. The Solar Dynamics Observatory captured a video of the X1.1 solar flare as it erupted from the sun. The spacecraft is one of several space-based telescopes constantly monitoring the sun for signs of solar flares and other space weather activity. While today's solar flare marked the strongest of the summer season, which began in late June, it is not the strongest of 2012. In March, the sun fired off an intense X5.4-class solar flare. Today's sun storm marked the fifth X-class solar flare of the year. Earlier today, space weather officials warned of more potential flare-ups from sunspot AR1515. The sun has been undergoing substantial activity this entire week from several sunspots on its Earth-facing side. "The bulk of activity is coming from Region 1515, a moderate-sized active region with a magnetic field complexity that harbors an isolated chance of X-class flare activity," SWPC officials said in an alert released before the X1.1-class flare. In a new alert announcing the X-class solar flare, SWPC officials said the sun storm could a "wide-area blackout" in the high-frequency radio communications. Scientists measure the strength of solar flares in terms of energy classes, with X-class flares being the strongest sun storms. Moderate flares rank as class M storms and can supercharge Earth's northern lights displays when aimed at our planet. Class C solar flares round out the top three and have little impact felt on Earth. Young said there was a chance the sunspot could trigger a massive explosion of solar plasma known as a coronal mass ejection (CME). "The region is still in a position to produce an Earth directed coronal mass ejection (CME) but since it is no longer at disk center the chances are less," Young said. "It should also be noted that even at disk center CMEs don't always head to Earth." CMEs unleashed from the sun earlier this week were expected to arrive at Earth in the next two days, possibly amping up geomagnetic activity, SWPC officials said. When aimed directly at Earth, X-class solar flares and CMEs can potentially endanger satellites and astronauts in orbit, interfere with GPS and communications signals, and damage power system infrastructure on the ground. Sunspot group AR1515 is by no means the only active region on the sun today. Nor will it be the last this week, Young added. "There is a new active region that is starting to come into view on the lower half of the sun," Young said. "It should be completely on the Earth facing side of the solar disk in the next day." Editor's note: If you snap a photo of sunspot AR1515 or any amazing northern lights photos this week and you'd like to share them for a possible story or image gallery, please send images and comments to managing editor Tariq Malik at tmalik@space.com.